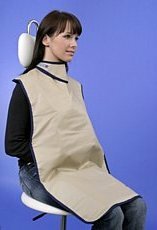 Our company was established 1993 with the idea of enforcing radiation protection and quality assurance in radiology in our country. The initial business activities consisted of manufacturing protective collars and aprons and selling X-ray films, cassettes, intensifying screens and QC equipment. These days we offer wide range of products and services covering the whole process of taking, developing and reading X-rays. We are looking for reliable partners abroad, concerning export of the below described products. Should you be interested, do not hesitate to contact us by e-mail, fax or phone to get further information. 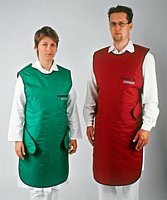 With all the protective aprons, collars, etc. we use only high quality lead rubber or vinyl from leading European manufacturers as shielding material to maintain the highest level of safety, durability and comfort. The quality of our products is approved by the CE mark. 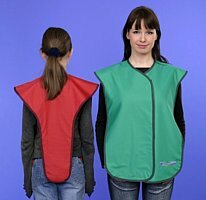 Very light and comfortable, no shielding on back side. Special side grip, no shielding on back side. Back side shielding equivalent 0,25 mm Pb, front side 0,25 mm, 0,35 mm or 0,50 mm Pb. Two-part collar for medical personnel, shielding equivalent 0,25 mm, 0,35 mm nebo 0,5 mm Pb. One size fits all. (C) VMK-RTG 2014. This web page is administered by company webmisters.